Submitted by witness on Friday, June 15, 2012. 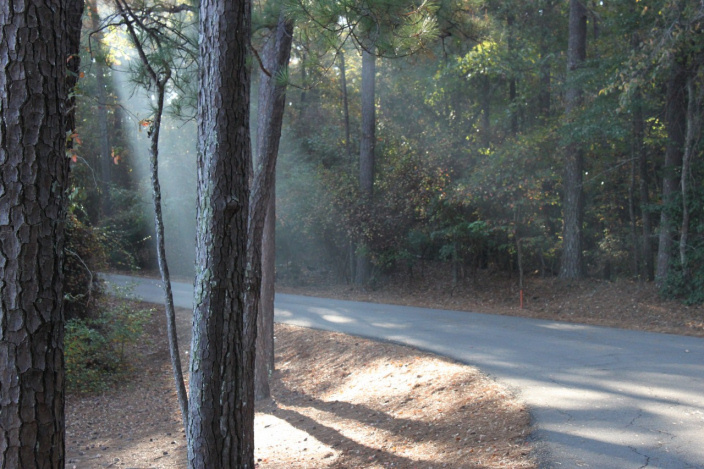 LOCATION DETAILS: Clarkco State Park is located just off US Highway 45 about four miles or so north of Quitman, MS. OBSERVED: At the time of this occurrence we had been at Clarkco State Park for two nights in a cabin. The previous morning, Wednesday, October 20, 2010, I had walked the length of the cabin road to its dead end, turned around, and then walked the length of the cabin road all the way across the dam to the park headquarters building. During this time I shot photos of leaf colors, a duck on the water, and various other things. Nothing unusual was seen or heard that morning (morning of Wednesday, October 20, 2010). The following morning (Thursday, October 21, 2010) I awoke around 730AM. My wife was still asleep. I had a bite to eat, put on my clothes, got my digital camera, and headed out on the road towards the dam of Clarkco Lake to get some early morning photos. The time I left the cabin was about 815AM CDT. The temp was down around 45 degrees that morning and there was a light fog coming off the lake. The morning was completely clear – brilliant sunshine - with no overcast and some light breezes now and then. I tried to sneak up on some turtles that were out on a log to shoot a photo, but they were too quick for me. All of them slipped into the water. I shot a few photos of the lake, leaf colors, and the fog from the south end of the dam (the end away from the park headquarters building). After shooting several photos I headed back to the cabin on the road that led away from the dam. When I was about 150 feet from our cabin I heard a distinct knocking sound like you would get if you were hitting a 2x4 with another 2x4, or maybe hitting a 2x4 with a hammer. I thought there might be some carpenters doing some work at a house located nearby. However, we were inside the state park and I knew of no houses – other than the ranger houses - within the park. This knocking sound continued on. I didn't count the number of "knocks," but I'd say they numbered at least ten knocks and were in a steady rhythm. I stopped walking and looked directly into the wooded, hilly area in the direction the sound seemed to be coming from (towards the south). The knocking stopped when I stopped walking. I saw nothing and heard nothing while I was stopped on the road. There were no odors in the air at this time either. As mentioned above, there was a light breeze blowing from time to time that morning. I then proceeded to walk to our cabin which was only about another 75 feet away. As I began to walk the knocking sound started again and this time I attempted to count the knocks. There were five or six knocks in a steady rhythm. Then there were no more. When I got into the driveway of the cabin I again looked in the direction that I thought the sounds came from and saw nothing. Could this sound have come from construction work between the state park and U.S. Highway 45? Could there have been a utility company crew working in the woods on a power line? I have been in the woods for years as a Scout leader, a camper, and as a hunter, I have heard woodpeckers and other animals make noises before. This was not a woodpecker. It was not a deer hitting a tree with his rack. This was a heavy and deliberate sound. This knocking sound was unlike any animal sound I have ever encountered. There were no "whoops," "calls," or other noises, just the wood knocking sound. The knocking was a "hard" sound almost like a carpenter hitting a piece of wood repeatedly with a hammer in a steady rhythm. That's one of the reasons I lean towards it being a sound from a construction site. However, the fact that the knocking stopped when I stopped walking and looked into the woods, and then resumed when I began walking again, makes me think there are other possibilities as to its origin. After coming home from the state park I listened to wood knocking sounds on the Bigfoot Field Researchers Organization website. The wood knocking sound I heard exactly matches the recorded wood knocking sounds on some of the bigfoot websites. Again, the sound was similar to hitting two 2x4s together or pounding on a 2x4 with a hammer. During midmorning of that same day we left the state park and went to Meridian for a few hours. My wife was not feeling well when we returned, so when we got back to the state park we packed our belongings in the car and headed for home. We had paid for three nights at the park, but we only stayed two nights. We left the park around 330PM CDT that day. I didn't hear or see anything out of the ordinary the remainder of the time we were in the state park. N 32 degrees, 5 minutes, 53 seconds W 88 degrees, 41 minutes, 44 seconds. OTHER WITNESSES: No other persons witnessed the sounds. OTHER STORIES: I don't live near this area, and don't know if others have heard similar sounds or not. TIME AND CONDITIONS: It was around 830AM on a clear and cool morning. ENVIRONMENT: Hilly and wooded terrain surrounding a lake. I spoke with the witness, who is a retired electrical engineer and he struck me as a very sincere, honest and detail-oriented individual. He estimated that he was approximately 80-120 feet from the source of the knocks, but due to the thick woods and rolling hills, he wasn't able to see who or what was producing the knocks. The witness is an amateur photographer and he was kind enough to provide us a photo that was shot just prior to hearing the wood knocks. As is evident in the photo, the surrounding woods are indeed quite thick and there are nearby hills that could easily obscure or block his view of the source of the knocks. Even though the witness didn't see the source of the knocks, there have been several Class "A" sightings in this county to corroborate the fact that this witness could have heard knocks possibly coming from a bigfoot(s).